John Lapraik was a poet, a son of Muirkirk and a friend and contemporary of Robert Burns. The Lapraik Festival takes place each year in Muirkirk. The motor sports complex at Kames is owned and operated by the East Ayrshire Car Club. a range of both indoor and outdoor sports facilites exist at various locations in Muirkirk. 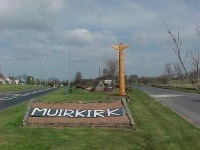 Muirkirk's three Totem Poles can be found in the Heritage Layby, at the eastern end of the village and at Glenbuck Loch. Each pole helps to tell the story of the Parish of Muirkirk past and present.